It’s Holocaust Remembrance Month at Scholastic, the Wal-Mart, Starbucks, Google and Bank of America of book publishers. And I say this with an exclamation point, so you know how important I think you should think it is! In the edition of Scholastic’s Arrow catalogue that came home from school with my son last week, I found the familiar face of Anne Frank smiling at me from a spread called “It’s Time To Celebrate!” which also included books for Poetry Month, Mother’s Day, Earth Day and April Fools’ Day. 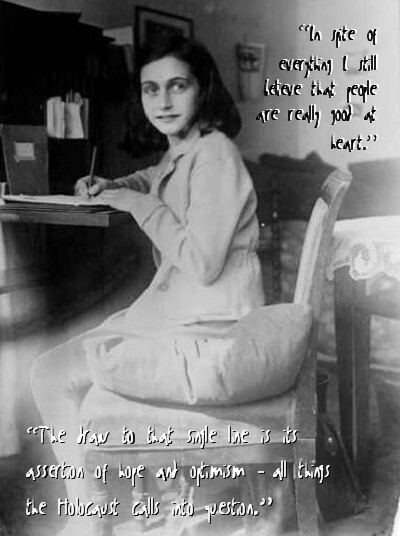 In addition to Anne’s own “Diary of a Young Girl” (The World-Famous Autobiography! as Scholastic informs us), the Holocaust Remembrance Month offerings include the “Holocaust Pack” (3 Stories of the Holocaust!). I don’t know which is the most offensive, the continued romanticizing of the Holocaust and sugar coating of Anne Frank’s life and terrible death; the clueless placement of the Shoah alongside mundane and even trivial “celebrations”; the grotesquely named Holocaust Pack, which sounds like it should come wrapped with a slab of bubble gum inside; or those damned exclamation points! Beware when exclamation points are confused with periods. It means the writer has no clue as to how to create emphasis or focus, or doesn’t believe the reader will be able to draw the proper conclusion from a sentence, or fears the reader might somehow miss the sentence altogether, and so decides to say “look at me, look at me” by punctuating with an exclamation point. But emphasize everything, as one of my university professors taught, and you emphasize nothing. Anne and her family hid from the Nazis for two years! Scholastic tells us, not far from Fool your friends with these hilarious jokes and pranks! In that case, doesn’t Anne at least deserve two exclamation points? !